combining Inbound and Outbound Marketing. We create long term lead generation and lead nurturing through Inbound Marketing, including Micro Targeting to deliver greater results faster, and Outbound Marketing for when you need the extra push for your sales. You need to get a good Return on Investment for your marketing spend. It needs to bring you new customers, get your existing customers spending more and getting them to renew. We have carried sales targets ourselves as sales people and management we understand your need to cut through the marketing fluff and deliver results. The way customers buy has changed. You don't get the chance to build up a relationship and become a trusted advisor, the customers trusted advisor now is a Google search. This means you need to get in front of customers when they search for businesses like yours. Inbound Marketing brings the customers to you. It's made up of elements that you are familiar with and some that may be new. Inbound Marketing creates a structure and process that captures interest, brings them into your funnel and nurtures them through to a sale and on into their contract. 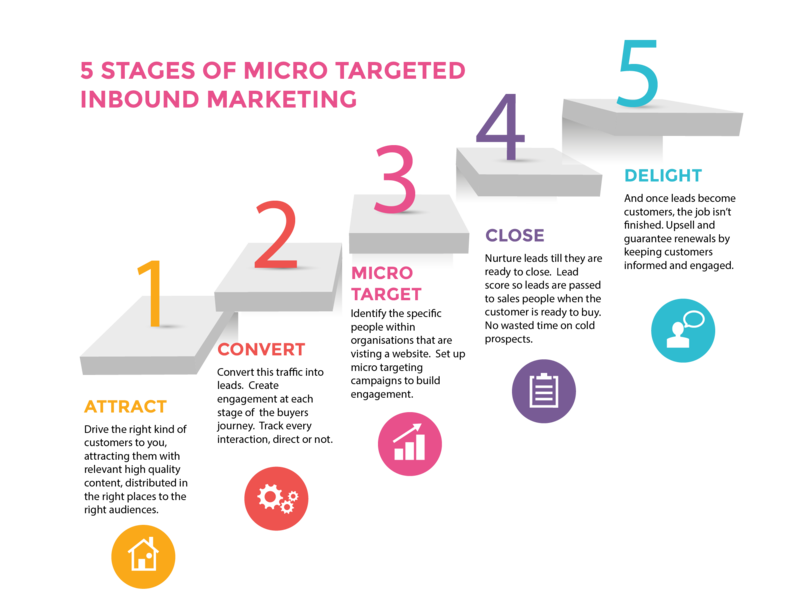 And Micro Targeting lets you take control of the sale quicker than Inbound Marketing on its own. Inbound marketing is built up of multiple elements that combine to make a powerful customer magnet. While every company is different all the elements are required to deliver the best results. We will work with you to review priorities and identify the areas that will need the most focus. Some of these may already be handled in house by your own team and we are happy to work alongside them to deliver a brilliant outcome. Your existing customers, including interviewing some to gain invaluable insight into why they chose you. The wider market to understand why buyers are choosing alternative suppliers and solutions. Our decades of experience in sales and marketing allows us to bring additional insight to this process. How do they make their choices? The buyer's journey is a model that allows you to target the right content and contact at the right time and travels through Awareness, Interest, Consideration, Purchase, Post purchase and Repurchase. Your existing customers, and where possible we like to speak to prospects in your pipeline to gain insight into their internal processes. And our work with many companies helps us to form a strong picture of activities within they market and the positioning of competitors cross the journey. Up to 70% of the buyers journey will have been completed before any direct contact has been made with you. To capture buyers during their research phase you need high quality engaging content that both informs and, where appropriate, entertains. Content ranges from in depth researched White Papers to Infographics. Content is built as a part of a campaign and is matched to the buyer persona and to the buyers journey. Typical campaign content includes a hero piece, such as a white paper, supported by smaller pieces focusing on a particular aspect of the research. Blog posts, infographics and social media posts are also produced to ensure that the campaign reaches the target buyers. Getting the message seen across Owned Media and Earned Media is at the heart of any successful campaign. Breaking out of your website and onto third party sources can make the difference between success and failure. We start with the elements in your control such as your website, listings and social media. And then we work on things such as Press and PR. This can include guest writing for industry blogs or paid distribution of the hero content into publications that have been identified as key sources of information for your buyers. Creating the conversation online should include interaction with your followers on social media. You know what your company stands for, you know what people should think and feel about doing business with you. But after time this message can get lost. We will work with you to make sure that your message is consistent across the company. We'll look at the directories you are listed in, the online presence you have, including your teams Linkedin profiles, every where that a potential buyer may find you and read about you. And we will make sure that if you can't be found, you soon will be and anything about your company online that doesn't match your vision will be corrected. Search Engine Optimisation combines technical and creative elements to ensure that prospective buyers can find you online. We will look to see if your keywords are still relevant and that your website meets the technical performance requirements that are needed to rank highly in search engines. The content that we produce will be indexed to boost your search engine rankings. And the content distribution will help with Off Site search engine optimisation by creating high quality relevant backlinks to your website. Getting the balance right on social media is a challenge. Too little and you look like you are a stagnant company, too much and it is a distraction. But when you get it right it is a powerful medium to connect to your buyers. Consistent, regular, on message posts can boost your brand reputation. When that message is linked to your campaigns it helps to build a stronger brand confidence for your customers. Whether on Linkedin, Twitter or Facebook, connecting directly to your buyers using the communication medium that they want to use, can put you ahead of your competition. And as the millennial generation move into roles with buying responsibilities it is becoming increasingly important to remain relevant and current. We also review the use of social media by your team. Inbound marketing can sometimes feel like you are waiting for the buyer to move slowly along your funnel until they finally decide to make contact. And that's because that is exactly what his happening. So we have introduced Micro Targeting. Micro Targeting identifies the companies that are visiting your website and engaging with your content and identifies the key individuals that are most likely to be looking based on role and interest. We create micro campaigns for those people. From this we dramatically increase the levels of engagement with prospective buyers and slash the sales cycle, putting you back in control of the sale. Technology continues to move on apace and in marketing technology is no exception. But sometimes it can be overwhelming and often the solutions presented do not consider sunk costs into existing technologies. We will advise on the technologies you need to adopt such as identification of web site visitors or automation of lead scoring and join these together for you to provide an automated system that frees up internal resource while producing greater results and visibility to your pipeline. Sometimes there still needs to be human intervention in the process and we can help you there too. And if you did want an end to end automated solution from the first click of an email to the renewal of a contract we can do that for you. Marketing automation makes the intelligence, once the preserve of big business, available to all. Harness the power of chatbots within your business. A chatbot is a cool bit of automated messaging programming that uses AI to speak with people, just like they were interacting with another person. The chatbots are programmed to respond to questions, give answers and then take actions depending on instructions. Connect them to your Facebook advertising to provide exceptional response. Use them to qualify your customers. Provide around the clock customer support. Chatbots combine AI with great copy writing and content to give your customer a brilliant experience. Generate a steady flow of leads through LinkedIn automation. We will take the buyer persona and create an ideal customer based on role , industry and location. we will create a master list and then automate contact. This work can not stand alone, it needs to be backed up with content to give you authority and a reason for people to link to you. This connection is then followed up with messages with LinkedIn to create an engaged audience and leads. Too many companies spend money on marketing without clearly defined goals or metrics to enable understanding of success. We can provide a level of visibility and reporting that will let you make important decisions earlier. Gaining a truer picture of a sales and marketing pipeline will help you plan your year. More accurate forecasting can help with capacity planning and performance management for the sales team. Measuring what is working enables you to spend your money where you are going to get results, doubling down on the activities that bring buyers through the door and turning off those activities that deliver little. Take control of your sales and marketing like never before. If you are only now at the start of inbound marketing you may need an immediate or quick boost to the sales and marketing pipeline. Outbound marketing activities can open up opportunities quickly. When we undertake outbound activities for our clients we always tie them in with inbound marketing activities such as content and marketing automation to provide the highest response rates and the clearest visibility of results. Getting in front of your buyers. Paid advertising is the quickest way to boost the sales and marketing pipeline. Whether that is Google Adwords or Facebook advertising you can be adding leads into the top of the funnel within hours. Knowing where your buyers are online will allow you to target your ad spend accordingly. Linking your ad spend to a campaign can increase the audience for content as well as creating awareness and demand for your products and services. Paid advertising doesn't have to cost a lot, defining clear goals with an understanding of the buyers preferences to consume information can open up new channels for very little money. Your message straight into their inbox. Email campaigns done well can be an extremely cost effective way of reaching a large audience quickly. But done badly they not only risk your reputation but also expose you to the risk of a potentially damaging fine under GDPR. All our campaigns, including Micro Targeting are content driven to provide real value to the recipient. Email campaigns are GDPR compliant and sent out only after carrying out a three stage legitimate interest assessment. The campaigns are monitored and managed, handling any enquiries from the data subjects. We provide targeted list building to ensure that the recipients are going to benefit from the automated email nurturing sequence, with human monitoring to make inteligent decisions and responses. Often used as a part of Micro Targeting or to support a wider campaign telemarketing is still a powerful way to make first contact with a prospective buyer. We work intelligently into existing customer bases for up selling or highly targeted calling to get to the identified target buyers. Our callers typically have ten plus years of industry experience enabling them to qualify the buyer prospect and having instant credibility when talking about a subject. Calls are not measured on a volume basis but are based on results. And as you have made it all the way through down to the bottom ask us about our unique shared success model where you hold back payment of we don't meet our KPIs.